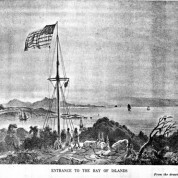 The reproduction of the sketch by Le Breton (the ship’s surgeon) at first glance looks like the Kororareka flag staff, but look again. The American flag is flying and so in all probability the location is Okiato Point which was then owned by James Reddy Clendon, the honorary American Consul. However according to annotations hand written by Marie King on a copy of the sketch found in the archives of the museum, the flag is flying from Gilbert Mair’s property at Te Wahapu. On 29th April 1840 the French corvette Astrolabe under the command of Dumont D’Urville set anchor in the bay not far from the village of Kororareka. The main purpose of the visit was to provision the ship and take on fresh water. Of course the French were eager to visit the catholic mission and were hosted by Father Petit ,Bishop Pompallier being absent at the time They were brought up to date on the news of the annexation of New Zealand by the English and of the signing of the Treaty at Waitangi.They remained in the bay for only four days. D’Urvilles diaries mention the presence of American ships but no mention is made of any contact with the crews. They met many dignitaries but nowhere are the names Clendon or Mair mentioned. So this poses several questions: why was there no mention of a visit to this property when everything else had been meticulously documented? Why would Gilbert Mair fly the American flag and is the site Okiato or Te Wahapu?